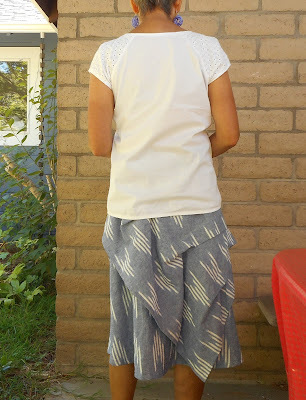 The main focus of this post is on the tucked skirt from Vogue Patterns V1333.I absolutely love this skirt. I love the feel and comfort of this cotton/linen fabric I bought at JOANN. I also love the print and how it changes angle with the pleated overlay. The pattern calls for cutting the overlay on the crosswise grainline, but I didn't have enough fabric to do that so I just cut it on the lengthwise grainline. I don't see any strange stretching issues with the overlay so I think it's fine. If you want to save a bit of fabric, I would do it that way, although cutting on the crosswise might be more interesting, depending upon how your fabric pattern looks. I also shortened the pattern quite a bit. 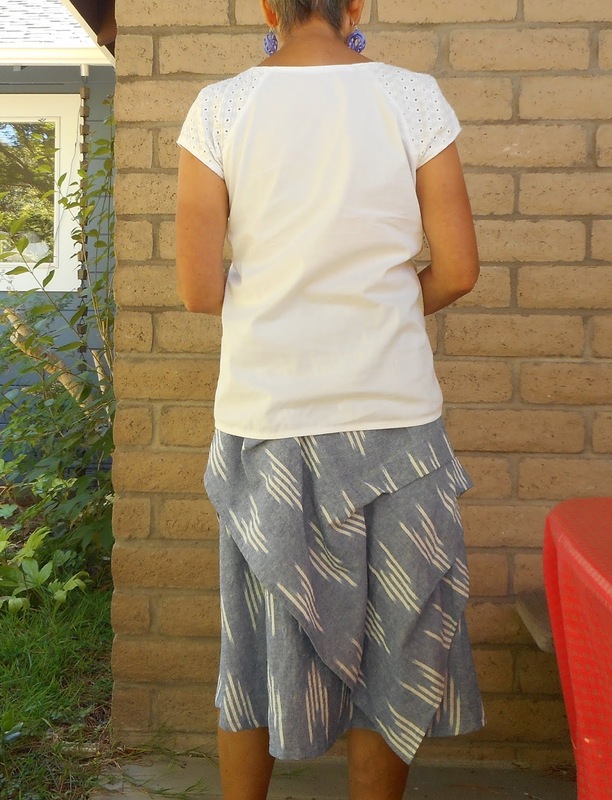 This is a relatively long skirt and I'm a relatively short person at 5'3" (and shrinking :)). I did all the length adjustments at the bottoms of the skirt and overlay pieces. I also removed the asymmetrical hem aspect. 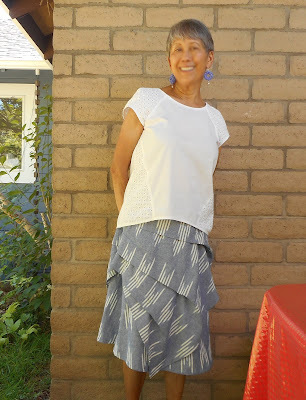 The pattern calls for the skirt to be shorter on the left side, but I found that the asymmetry wasn't obvious enough and it just looked like I made a cutting error. Plus, it was still too long on the right side. So, I removed the asymmetry and shortened everything a bit more, although I left it curving down a bit on the front and back centers. The pointy tip of the overlay hangs longer than the skirt body a bit, which I actually like. 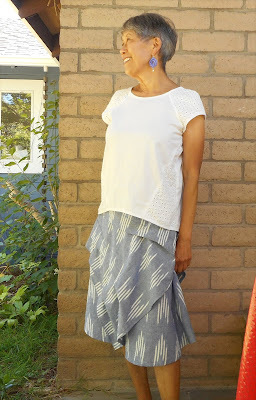 This skirt will see a lot of wear throughout this summer and into fall and even some milder days of winter. The top is a second rendition of McCalls M7093, which I blogged about here. This one uses a slightly stretchy cotton for the body and a cotton eyelet fabric for the sleeve caps and side pieces. The neckline is a little bit wider than the pattern neckline and the length is shorter. I live in the San Francisco bay area. My best golf score is about the same as my best bowling score. Someday, my dreams will come true on Craigslist. Check out the fantastic 3D printed jewelry and fun stitch markers that I have on sale in my Etsy Shop!